What if the most important thing of your day was the first thing you did? For me, that thing is writing. Writing is the seed of everything that I do. It all starts with writing. I was a night owl all of my life. I hated waking up early. So why did I change? One day, I decided to log my output and run a test: do I write more at night or do I write more in the morning? After several weeks, I had the data in front of me: I wrote twice as much in the morning. Okay, so obviously I’d get results if I woke up early. But we still had a problem: I hated waking up early. How do you wake up early when you feel like it isn’t something that comes naturally to you? Good news: waking up doesn’t come naturally to me either! But I’ve developed a system that works. I made a 3-month guide to waking up at 6am consistently that I share with you in today’s show. I’ll also share 5 tips for getting out of bed at 6am. When you wake up and react to what the world has for you, it sets the tone for your day. Tracking the results of new habits allows you to learn about yourself. You’re either in control or you’re being controlled. If you do the most important thing first, you feel accomplished the rest of the day. A successful morning routine starts the night before. Optimize for production instead of consumption by being the one to decide the first thing you do each day. Don’t react to the world by checking email and social media as soon as you wake up. Redefine success gradually in each stage of your habit building (see below). You can’t change all of your habits at once—define success one metric at a time. Update the definition after you automate the habit. 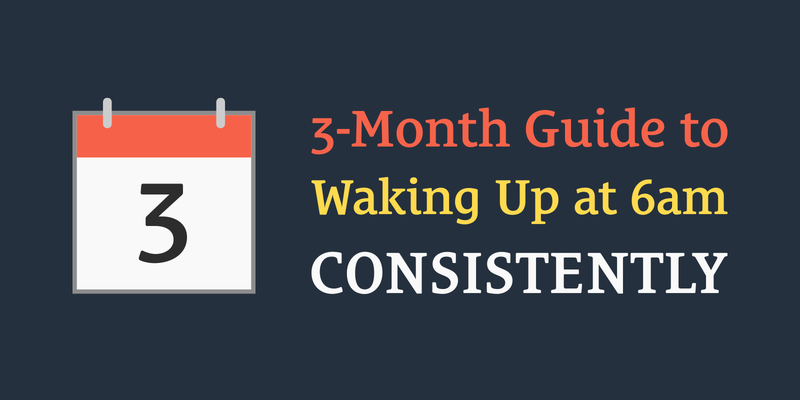 With this guide, there is only one metric of success each month—only one thing defines your success. Each month, you redefine “success”. Month 1: Stop work at 5pm. ✅ The day is a success if you stop work at 5pm. Do this for a month (or until it’s automatic). Month 2: Shut down at 9pm. No screens (TV, computer, laptop, phone, iPad). Lights off in house except bedroom (can use home automation for this). Get ready for bed (brush teeth, shower, whatever you need to do). Read a book with extra time. ✅ The day is a success if you shut down at 9pm. Do this for a month (or until it’s automatic). NOTE: Success is not defined by lights off time. It’s defined by shut down time. Preparation is everything. If you ever fail to sleep at 10pm, it will be because you didn’t shut down at 9pm. Month 3: Wake up at 6am. ✅ The day is a success if you are out of bed at 6am. Do this for a month (or until it’s automatic). Month 4 (optional): Wake up at 4:30am. Depending on how much sleep you want to get, you can move up your shut down time. Sometimes we shut down at 8pm. Sleeping by 9pm gives you 7.5 hours (or 5 full sleep cycles). ✅ The day is a success if you are out of bed at 4:30am. Do this for a month (or until it’s automatic). The key is to establish a singular definition for success in each stage. I have 5 different tips for you because some of them will resonate more or less depending on your personality type. Grant Cardone says, “Never take advice from a quitter.” Do you agree with that? I did. Then he said, “You quit on yourself every time you hit snooze.” Ouch. He got me. Put your phone or alarm across the room so you have to get out of bed to turn it off. Have somewhere to be, something to do, or someone to meet. Have an aim. At the end of the previous day, write down the top three things you want to accomplish tomorrow. Much of my work throughout the day is writing, but each day is different. I often need to edit podcasts or videos as well. I always journal first thing in the morning, and I typically write a couple thousand other words during the morning work window.